The 3-2-1 method for making BBQ smoked pork ribs consists of 3 basic steps. 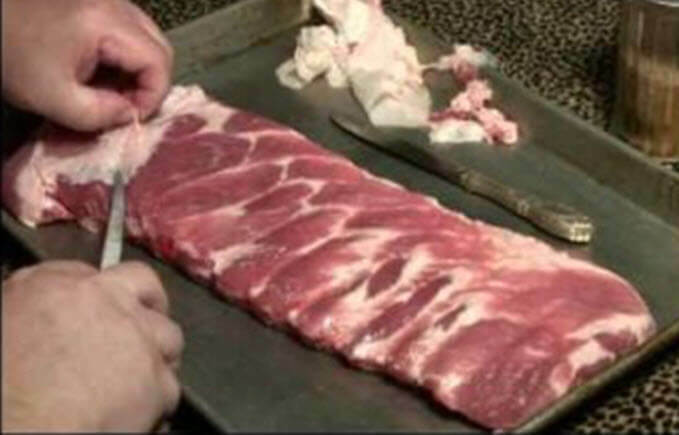 The first step is to prepare the pork ribs for smoking and smoke in your smoker for 3 hours at 225 to 250 degrees basting as needed to keep them moist. At the end of the first 3 hours wrap the ribs in double thick aluminum foil. Put them back in the smoker (or your oven) for another 2 hours at the same temperature. At the end of the 2 hours in the smoker, take the ribs out of the foil and then put them back in the smoker or oven for up to another hour. Some people skip this step and instead add barbecue sauce and put them on the grill until the sauce caramelizes. This guy does a walkthrough of making a set of smoked pork ribs using the 3-2-1 method. He used a rub made with a mixture of yellow mustard, brown sugar, apple cider vinegar, dried rosemary leaves, celery seed, mustard powder, onion powder, garlic powder, table salt and freshly ground black pepper. Then he basted the ribs with the rub and put them in the refrigerator overnight. At each step of the 3-2-1 method he basted the ribs again. We would skip the oven bag step and just double wrap the ribs in foil and put them back in the smoker. Yes, the oven does work if you are having problems keeping the smoker hot enough but why mess with the oven if you already have a hot smoker? Share your thoughts on this process or recommend your own. Add any pictures if you have them.